The Pittsburgh Pirates have had some bullpen issues this year, but they are still right in the middle of a playoff chase. One of the teams they are chasing is the San Francisco Giants, who hold the first Wild Card spot. The Giants recently called up two pitchers to reinforce their bullpen and both of them can hit triple digits on the radar gun. They are also both former Pittsburgh Pirates minor league players. On September 1st against the Rockies, the Giants were trailing 9-7 going into the bottom of the 8th inning. They called on a 25-year-old, 6’4″ right-hander out of the pen to make his Major League debut. Hunter Strickland fired a scoreless eighth inning and the Giants ended up tying the game in the top of the ninth. Strickland came over to the Pirates from the Boston Red Sox in the Adam LaRoche deal. That day, he followed two other former Pirates out of the Giants bullpen, Jean Machi and Javier Lopez. 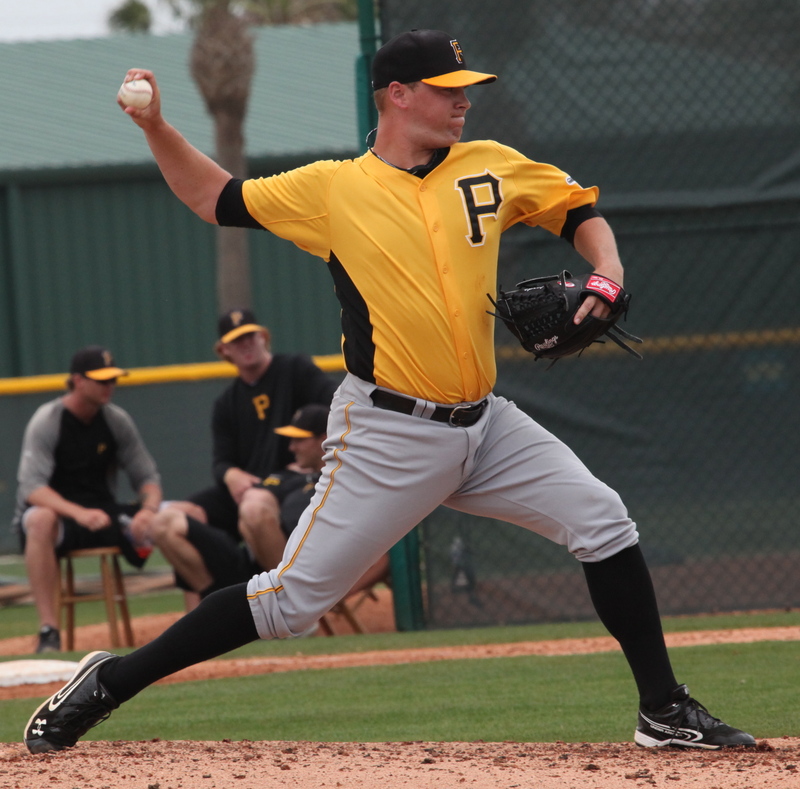 Two days later, another Pirates reunion took place on the mound, as 28-year-old Erik Cordier made his Major League debut in the seventh inning of a start by Ryan Vogelsong. Cordier was then followed by Strickland’s second appearance. Cordier is also a 6’4″ righty and just like Strickland two days prior, he made quite an impression in his debut. When Hunter Strickland was with the Pirates, there were reports that he hit 94 MPH as a starter, but there were never reports of him reaching rare air with his fastball. Cordier on the other hand, hit 100 MPH while with Indianapolis last year, he just didn’t have the best results. Strickland missed a lot of time in his young career with shoulder and elbow surgery, while Cordier has spent nine seasons bouncing around the minors, first as a starter, then as a reliever. This year in the hitting-friendly Pacific Coast League, Cordier had a 3.59 ERA in 52.2 innings, allowing just 40 hits, with 68 strikeouts. Strickland pitched briefly in High-A ball before moving to AA, where he had a 2.02 ERA and 48 strikeouts in 35.2 innings. He was used as a closer for awhile, picking up 11 saves. When both of these big righties took the mound last Wednesday, Cordier threw his first pitch at 100 MPH and 20 fastballs later, he had touched triple digits another 15 times. He hit 101 on the gun seven times. Strickland followed him by only hitting 99 MPH, though he hit 100 in his debut two days earlier. There was talk already that Strickland could be considered for the Giants closer role down the line because the team was so impressed with how he has progressed in such a short time. These two players obviously were not seen as big losses at the time they left the Pirates. Strickland had trouble staying on the field during his time in the system. The Pirates saw enough in him at one point to add him to the 40-man roster, though they weren’t able to sneak him through waivers just prior to Opening Day last year. Cordier pitched a long time in the minors with marginal results and he left via minor league free agency, though the Giants added him to the 40-man roster after signing him last November. It would be nice to have two options in the bullpen this year throwing 100 MPH and it would be even better if the team you were chasing didn’t have them in their pen. So far, going into Wednesday night, they had combined for just four shutout innings, which isn’t enough of a sample size to pass judgement. They may end up being valuable bullpen arms, or they might just eat some innings and not see any playoff time. Still, it would be a nice option for Clint Hurdle to have in September. If things somehow stay the same, it might be the Pirates facing one or both of these pitchers late in a crucial all-or-nothing Wild Card game. Pittsburgh: The Pirates are 3.5 games behind St. Louis for the NL Central lead and 1.5 games ahead of both Atlanta and Milwaukee for the second Wild Card spot. They are four games behind San Francisco for the first Wild Card spot. Today’s Starter and Notes: The Pirates won 6-3 on Wednesday night and they finish up a four-game series with the Phillies today. Francisco Liriano will make his 26th start of the season tonight. He has not faced the Phillies yet this season. Liriano threw six shutout innings in his last start, striking out nine batters while allowing three hits and two walks. On the road this season, he has a 2.67 ERA in 11 starts. That’s much better than his 4.58 ERA in 14 home starts. The minor league season is over. You can read the DSL season recap here complete with scouting reports for each player and the top ten players to watch list can be found here. We will post other season recaps soon. With the minor league season over, it’s time to take a look back at some recent video from the GCL, which we will continue to do over the next few days. All videos are courtesy of the GCL Pirates fan page. Below is a video of catcher Yoel Gonzalez, who was the youngest player on the GCL Pirates this year. Gonzalez has shown better defense than offense early in his career, though he showed slight improvements with the bat moving up from the DSL this year. He had a .523 OPS last season and a .220/.285/.287 slash line this year in 40 games. 9/8: Pirates release Ernesto Frieri. 9/7: Michael Martinez and Chris McGuiness clear waivers and were outrighted to Indianapolis. 9/2: Pirates recall Gregory Polanco, Jeff Locke, John Holdzkom, Casey Sadler and Bobby LaFromboise. 9/2: Chase d’Arnaud added to 40-man roster and promoted to Pittsburgh. Michael Martinez designated for assignment. 9/1: Pirates designate Chris McGuiness for assignment. John Holdzkom added to 40-man roster. Six former Pittsburgh Pirates players have been born on this date, including three that played for playoff teams, two were with World Series winners and another player whose big league career lasted just one relief appearance. We have catcher Don Slaught, who played for the three straight pennant winning clubs in the early 1990’s. Slaught played six seasons in Pittsburgh and hit .305 in 475 games. Dave Roberts was a relief pitcher for the 1979 World Series winners, but he wasn’t around at the start of the season. However, he played a big role for the team as part of the trade that brought Bill Madlock to the Pirates. Roberts had a 3.26 ERA in 21 appearances that season. Jackie Hernandez was the shortstop for the 1971 champs. He played 214 games during his three seasons with the Pirates and started ten of the 11 playoff games in 1971. You can read mini bios of all three players mentioned above, plus three others, in the link here. Also included is a game recap from the 1982 season in which the Pirates got a walk-off homer to beat the Phillies. Previous articleFirst Pitch: Has Pedro Alvarez Played His Last Game With the Pirates? For me Strickland is more interesting of the two, younger and I think it is a safe assumption that the Giant saw something and corrected it or change it, which lead to the question what did the Pirate’s miss. Cordier also had 31 walks, 5.3 BB/9 and was charged with 11 wild pitches, in those 52 PCL innings. His past is littered with walk numbers > 5 batters/9. Andrew…we got Hunter in the Laroche deal. I wish we still had Adam. Lee I don’t share your nostalgia for LaRoche. if you are being paid several million dollars to play baseball show up ready to play when the season starts. Also his production with the Pirates wasn’t particularly great, the numbers look good in today’s offensive environment but compared to league average I think you want a little more from 1B. This is absolutely true, and it’s pretty incredible – at least to me – how much the offensive environment has changed. Not to me…once they got PEDs out of the game, this was bound to happen. Plus, you have all these shifts taking away hits. Andrew…sometimes a fan just has a fixation on a certain player. I just always liked him. I get that, I fixated on him but negatively, I just cannot get past those Aprils of hitting like a pitcher. I admit it is irrational but I’m fine with it. Why and how did the Pirates let go of Strickland?? Giants claimed him off of waivers last year April 2. Because of all of his injuries, he was out of options. If we end up facing the Giants in a WC game and get through Bumgarner again and into the Giants’ bullpen, it’s comforting to know that about all our Pirates can hit is fastballs. So bring ’em on. This site recently ran an article on why you never truly give up on a prospect, with John Holdzkum as the example. John’s Morning Report is consistent with that thought, just using former Pirates as the example instead of current members of the organization. Sometimes you HAVE to give up on prospects, just because of roster crunches, injuries, options, etc. We tried to sneak Hunter thru waivers, but the Giants were smart enough to claim him. It would appear that the Giants know that if the Pirates have someone, if nothing else that player has talent. We are constantly reminded in Pittsburgh when a player that once played here does something well somewhere else, I don’t know if they are trying to tell us how dumb the Pirates are or what. I bet the Cubs sure wish they’d held on to Josh Harrison! I think the Pirates are glad they held onto Josh Harrison, don’t forget at the beginning of the season Harrison was an afterthought, labeled a utility guy, mostly the 24th or 25th guy on this roster, so the Pirates did not know what they had in Harrison, just like they probably did not know what they had in these two pitchers. Yes John, and if they had only kept Bautista at third, Steve Pearce at first, and Javier Lopez as a LOOGY, their problems might have all been solved. Or,why not just say that’s the way MLB goes for all organization’s ? It’s to point out that these two are throwing 100 MPH and were recently let go by the Pirates for no return. I’m sure many people didn’t even realize they were in the Majors. I had no problem with trading Bautista at the time, didn’t like the return. It has been six years now, so he would have been gone awhile ago and chances are, without the adjustment Dwayne Murphy made as a last ditch effort, he may have never come close to what he did. Bautista was about a month away from being released when he made the change and started to hit. Assuming someone in Pittsburgh finally saw the same flaw after seven seasons that Murphy fixed, you haven’t followed the Pirates close enough if you think he would have been in Pittsburgh the last three years anyway. I think the point he’s making, is every team can go down coulda, shoulda, woulda lane. Not every prospect will pan out in the timetable an organization needs them too. My point exactly indy. Dreker didn’t get it I guess. Poor Leo’s feelings are hurt. Remember ace, you fired the first shot. Man up. Who would you have released from the 40 man in favor of keeping these guys John? I agree with the irony and frustration of seeing players having great success when they have left the Pirates, but occasionally it works the other way too: Melancon, Volquez, Worley, Martin, Harrison. Holdzkum anyone? Major league bullpens are littered with guys who have bounced around until they get it figured out. No system is infallible when it comes to determining when someone is going to develop into a major league player. Going by track record, the Bucs may be better than most. The real irony piraddict is that neither of those two guys have really had any sustained success yet. I don’t make it sound like anything John. The following commenters appear to have understood my intention much better than you have. So I won’t bother you with any more comments that you don’t think are valid. However, I will tell you this,I have seen almost every top prospect that has been in the Eastern League over the past 16 seasons. And I can tell you this : EVERY organization ends up losing guys without a return who come back a year,two years or whatever length of time later, to have some success. Why you think the Pirates would be any different is beyond me. By the way John, in case you missed it, prior to the 2014 amateur draft, there were 10 high school pitchers that were throwing any where from 97 to 102 mph. Many of your post are meant to be provocative. Just because you see a guy coming through AA for the last 16 years, means little or nothing when the dust settles. Why don’t you just smell the roses and enjoy the game of baseball. As Pirate fans, we should be grateful that we are seeing competitive ball, instead of trying to blast someone for their difference of opinion. Your opinion is no more valuable than mine or anyone else’s. Your act is wearing thin. Who did I ” blast ” Bill ? I didn’t blast John at all. ” Provocative ” ???? I pointed out that lots players get away and he didn’t get the point at all. Apparently you didn’t either. And, don’t worry about what I am doing, try worrying about yourself. I made it this far in life without advice from people of your ilk, and I figure I will make it a lot further without it. Apparently you’ve not read your own comments. His point wasn’t about “players” getting away for nothing it was about two guys that hit triple digits on the gun who got away for nothing. That’s not a common occurrence and that was the jist of his article. Apparently you didn’t get it. Remember John, posters like Leo and his ilk think they are scouts and journalists. They are envious that they don’t have your gig. Don’t take them seriously. Keep doing what you’re doing. You do a great job. You appear to be one of the more intelligent posters on here today Bill. Why do you care what any one else thinks about John Dreker’s column. As for envious ? Yeah, sure I am. I might get to watch more ball games, right ? I enjoy coming to PP to read up on the farm system. I enjoy the game of baseball. I don’t enjoy blowhards like you, who think they know more than someone else because they’ve seen loads of AA baseball. Using that premise, I should be more of an expert because I see the team at the major league level often. BTW, how would you see anymore games if you go to all Curve games? Plenty of AA ball with driving distance from Altoona too. What’s stopping you? Thanks for the validation on envy. It wasn’t hard to detect.